A great modification to your standard road bike is to install a set of clip-on aero bars. These bars will allow you to get into the aero position while on the ride section of the race. There are many benefits to this riding position – number one is being more aerodynamic. When you ride normally you sit upright and act sort of like an air brake. Because of the variety, we have put together this list to get you started with your decision process. 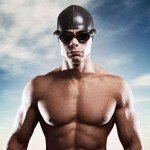 We may not cover all of the best triathlon aero bars but hope you can find something here that suits you. These are the most popular on the market at the moment. Getting aero pulls you down below the wind and significantly reduces you resistance mass allowing you to cut through the wind. In this post, we are going to review the best clip on and standard tri bars setup and provide details on some of the features of each set. So let’s get started with clip-on bars first. When it comes to clip-on bars for your triathlon bike Profile Design rule the roost. Our overall choice for the best tt bars goes to the new T5 aerobars. For somebody starting out they are ideal but are also suited to seasoned professionals. Yes, they are made from aluminium but they still come in well under the weight of a lot of the competition. Quality: Overall quality is perfection. Profile Design has invested a lot of time and effort into getting their products just right and it definitely shows here. Finish is exceptional and the coated bars are super strong. The EVA pads give you plenty of support and comfort even on longer rides. Setup: Setting up these bars is very straightforward. You have a couple of options on the bar diameter, 26mm or 31.8 bars will work here. The trick with the setup is to not tighten everything up too much at the start. Leave enough slack on the bolts until you test the fir for comfort. You may need to slide the bars along a bit in the clamps to get the bar reach spot on. You also have optional riser clamps you can use to adjust the height of the bars. 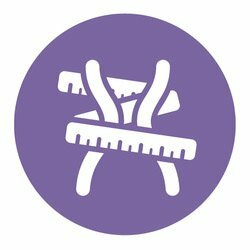 This really helps if your bike frame size is a bit off or you suffer from sore hips – move your position up a bit and you will notice the difference. Overall Thoughts: Every time you add something like aerobars to your bike you are increasing your aero-ability (if there is such a word). By clipping on a set of Profile Design T5’s you are getting the best budget aluminium aerobars on the market. The bars have a nice 13° bend in the extensions to give you that ultra aero position but still give you the comfort of a ski-bend style aerobar. A great feature with the armrests is that the bracket to attach them is separate to the main bar bracket. This gives you plenty of additional adjusting options so you can get really comfortable. You can spend anything from a few dollars up over hundreds of dollars for professional clip-on aero bars. They basically do the same thing but when you spend more money you start to get a lot of additional features. Primarily the bars will be carbon fibre – massive weight reduction compared to the cheap aero bars. A lot will also depend on your budget and how serious you are about racing. Because of the variety, we have put together this selection to get you started on your decision process. We may not cover all options for temporary aero bars but hope you can find something here that suits you. These are the most popular on the market at the moment. This question always comes up and has many answers. What are the aero bars for? A practice bike for training in the park or for your primary tri bike. The beauty of these types of triathlon bars is you can swap them out fairly easily. A couple of hex head bolts are usually all that holds them onto the normal handlebars of your bike. The cheaper sets tend to be made of some sort of alloy and as you go up in price you start to see carbon fibre introduced into the range. 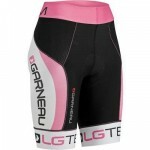 Carbon fibre is much lighter so if you have the budget then go for these instead. 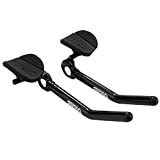 As stated earlier the beauty of clip-on bars is you can take them off the bike without much effort if they do not suit your riding style or you prefer the standard set-up. You will find though over time that you will adapt to the aero position while racing and you bike times will reflect this. 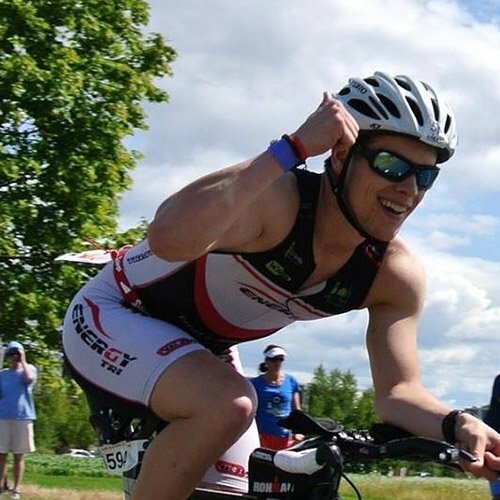 If you are serious about triathlon and want to compete at a higher level then you will need something much lighter and sleeker than the intro sets above. Carbon aero extension bars will definitely be on your shopping list for their massive weight reduction. Using these carbon aero bars does change a few things though. You will have to spend a few more dollars to get a set of tri bars you can work with, to keep the weight down and to get down and in the full aero position. Comfort plays a bit part in this too. Getting set up with a good comfortable set of tri bars is critical on longer rides. We suggest you try out a few different sets first if you can to make sure they suit. Watch out as well if you buy a second-hand pair. Sometimes the previous user will cut down the stems a bit and they may be too short for you. I have seen quite a few people start out with detachable aero bars on normal handlebars and then step up a level by purchasing a new Carbon Base Bar. Go to any Triathlon event and they are everywhere. This gives you the ability to reuse your existing bars but builds up a full aero set of handlebars without the expense of a pro set. However, as you progress in the sport you will most likely get yourself a full TT bike with an integrated setup. There are many benefits to using aero bars on a bike during a race but the primary one comes down to aerodynamics. When you are down in the aero position you remove quite a bit of body mass out of the wind. Because we are not the most aerodynamic of creatures getting down low you are giving yourself a huge advantage over the opposition who will sit upright and act as an air brake into the wind. The price of entry for a basic set of aero bars is very low. You can get something from as little as a few dollars. A couple of things to check out first though is the diameter of your handlebars. Make sure the bars will fit. Also as stated at the start of this post you can always remove the bars if you are not comfortable or happy with the riding style. If there was one thing we could say about the disadvantages of this type of setup is that because you are shifting your weight forward on the bike you are losing some of the stability and ride comfort of the original setup. It took me quite a while to get comfortable and feel really aero when I first installed the bars. I had to slide my saddle forward to its limits on the saddle rail and eventually ended up getting a kicked saddle post to move me even more forward. 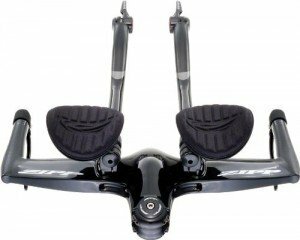 Road bikes are not designed for this type of setup but if you are looking for any sort of an advantage over a standard road bike set up for triathlons then installing tt bars are going to give you the best bang for your buck. It’s the closest you will get to a full TT bike setup without having to shell out 1000’s of dollars more for a frame etc. After clips ons I would then look to get a decent aero bike helmet. This will really help reduce drag and can make a huge difference in split times for your bike section of the race. The last thing I would look to upgrade is my wheels. Aero bike wheels don’t come cheap though and can be a bit challenging in windy conditions. I strongly suggest you go for something with a shallow enough profile to start with. 50mm deep is standard enough and will suit most conditions. The final thing we want to discuss today is how you can quickly modify your road bike and turn it into a triathlon style bike with two quick changes. Here is a great video showing you how to install a set of clip-on aero bars to your road bike. This handy upgrade is inexpensive but will help get you into that all-important aero position. First, you will need an angled seat post. This pushes the rider forward in the frame. Couple this with a nice set of clip on aero bars for a road bike and you are set. The video below shows you how to do this and the benefits of getting aero for the ride. 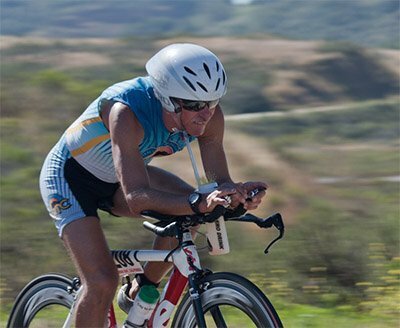 There is a multitude of options available when looking for the best triathlon aero bars for your ride. Whether you are looking for the most comfortable aero position or get way down into the aero ride, you will have plenty of choice with this selection of the best triathlon aero bars. You can also spend anything from fifty dollars upwards past eight hundred dollars for a set of tri bars. It really comes down to what you are comfortable with and how far you can stretch your budget. Is it for a leisurely ride around the park or for a high-speed sprint triathlon. 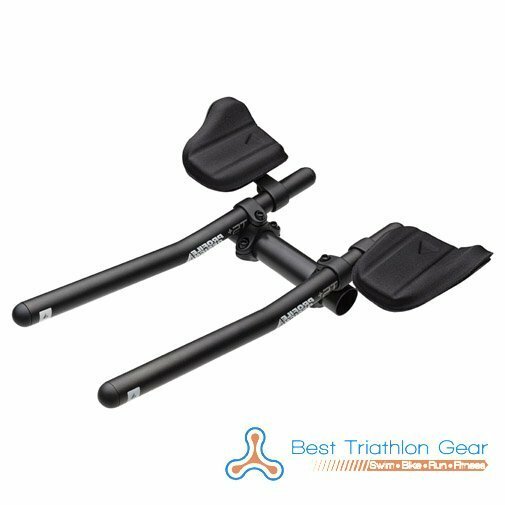 If you are just out cruising around the park then perhaps not, but if you are getting into triathlon as a sport then we suggest you go for it and even get yourself a set of cheap triathlon aero bars. You may then progress onto a set of carbon adjustable aero bars as you get into the sport more. A great question and the answer is – it depends. Are you just looking for something for you cruiser that you take on leisurely rides around the countryside then you probably won’t want to invest too much to start off with? Your first triathlon aero bars can be very basic and most likely made of aluminium. You can pick up a fairly decent set of intro aero bars for about fifty dollars. The beauty of these is because they are clip-on aero bars you can just take them off if you are not happy with the riding style. If you are in the market for a new set of aero bars and want to compete at a higher level then you will need something much lighter and sleeker than the intro set above. You will need to at a minimum consider carbon triathlon aero bars for their massive weight reduction. Using these aero bars does change a few things though. You will have to spend a few more dollars to get a set of tri bars you can work with, to keep the weight down and to get down and in the full aero position. Getting set up with a comfortable set is sort of trial and error. Compared to a standard road bike setup the aero position feels a bit odd when you start out. Your position on the bike can play havoc with your ‘saddle’ area so it takes a bit of getting used to. Also, because you are riding in a more forward position on the bike handling becomes a bit more challenging. The benefits of riding in an aero position far outweigh your comfort challenges in terms of performance though. Getting aero shaves valuable time off your race results and is the best way to hit that next personal best. Watch out as well if you buy a second-hand pair. Sometimes the previous user will cut down the stems a bit and they may be too short for you. Aero Bars – Next Stop Ironman. Taking things up another notch and you start to get into the realms of professional style aero bars. Again you will be faced with a multitude of options here. One of our favourites triathlon aero bars is the Zipp Vuka Stealth Aerobar . These really are an exceptional set of bars and come in at about 800g so light as well. If you want to look a little deeper into body dynamics and how things work while you are in the saddle then take a look at this excellent video showing off the awesome profile design triathlon aero bars. This is simple really. It comes down to aerodynamics. When you are down in the aero position you remove a bit of body mass out of the wind. We are not the most aerodynamic of creatures so by getting down low you are giving yourself a huge advantage over the opposition. Cheap to get set up. You can pick these up fairly cheap secondhand – make sure they have not been cut down though or you might find your arms are too long – you can’t cut them down to suit!! You might go for a set of clip-on aero bars. These are by far the cheapest and you can adjust them to your size. They are also easy to remove if you decide against riding with aero bars. Adding a set of tri bars to your bike changes everything. Just make sure your bike is suitable for this kind of aggressive racing. Th only other addition we would make to this is to add in a decent set of wheels and tires and you are good to go.